I do notice the light in the Mara is slightly different than say Botswana. There, the air is usually very dry (in the dry season of course ) resulting in sometimes a bit more crisp and vibrant colors. Advantage of the Mara, where a lot of times in the year there is more humidity in the air, is the light is slightly diffused; even later in the morning you could get away with sunlight. Any advice for those of us who have neither the budget nor the luggage allocation to bring such a range of kit, but who are interested in getting decent images anyway? I've got a 7D MkII. If I could only bring 2 lenses they would probably be my EF-S 18-135mm f/3.5-5.6 IS and a 100-400mm F4.5-5.6L IS II, with the Extender EF 1.4x III to provide a bit more range. Of course, as I write this I immediately think that I'll need something faster as well. This shot at dusk required f/1.8 at 1/125 at ISO 640. She was only 3 meters away - too close and dark for a long, slow lens to do justice. If you want something to work under those lighting conditions you will be looking at f2.8 at ISO 3000 (ish). The 7D2 should be usable provided you do not need to crop heavily or recover shadows too much - the only issue is the price of the lens so no, there is not much can be done! There is the 85mm f1.8 or the 200mm f2.8 at more affordable (I know, 'affordable' in these terms is relative!) end. We all marvel (and rightfully so) at the magnificent images of wildlife that have come from folks in the right place/at the right time/with the right equipment. For those of you that have not been to Southern Africa, please keep in mind that your subject matter has complete mobility and independence of direction, whereas you do not. Therefore today's telephoto zooms are of great benefit. Plus you can crop a 560mm image (shot with 200-400 zoom) 2.5X with little loss in resolution. I highly recommend skipping the supplied bean bags, and using a carbon monopod with long glass. I also heartedly endorse taking many, many Zeiss lens wipes ($5.00 / 100 at WalMart). 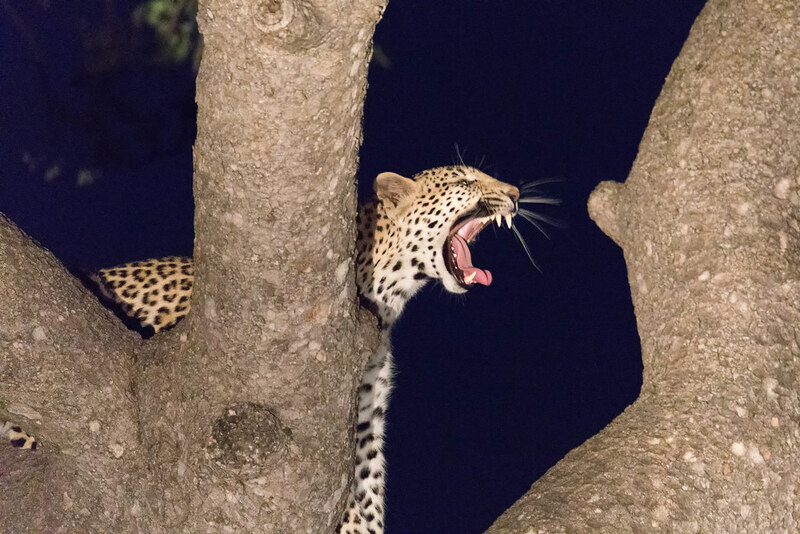 Above all, the most important thing you can take on a photo safari is patience. A good guide will reinforce that for you. In 2016, we returned to a particular pond for three straight evenings to try & capture a single male hippo (image attached). Do people ever try to change lenses in the field? If not, it would seem more practical to make choices and take 2 (or 3) bodies depending on interests. I'd be inclined to take a 24 - 70 mm f/2.8 on full frame, and 100-400 bare (no TC) on crop. If one is not interested in wide landscapes, an option could be 70 - 200 f/2.8 FF and either 400 f/2.8 +/- 1.4 TC or 500 f/4 for crop. One could always throw in a cheap non-sealed SL2 and 24 mm pancake for context shots. But how practical is it to drag along and deploy two or three cameras in a shared safari truck? Everyone else is carrying 2 cameras with big lenses and using monopods, etc. I am still seeing America first. Never been to Africa. Most group excursions will seat 5-7 people in a Rover, unless you go the expense of a private drive. The guide and driver, (plus tracker) will do the best they can to accommodate all, but not everyone will get the best angle. Also back of the Rover is often higher than the front, but the ride can be really harsh. Again I strongly recommend NOT changes lenses in the field. Concentrate on one body with long glass, plus something short & wide for landscapes. The 85mm f1.8 is what I used for the shot above, and I added the 200mm f2.8 to my collection earlier this summer. Got them both used, so about half the price of new. I've also got the 17-55 f2.8, but it only gets brought to low-light occasions now that I have the 18-135. Thanks for the article - it happens to be relevant to me and making choices of what to bring is not easy. Flight baggage restrictions is a limiting factor for most visitors. I'll know more after my trip to Kenya. I was in Tanzania close to 20 years ago and animals were very close. It wouldn't have been conceivable to have had a big white then. I recently just came back from Botswana. I brought a 5D3 and a 1D2 as bodies. Three lens: 200-400, 100-400, and a wide angle 16-35. This combo worked great. This was my first trip to Botswana and this selection of lens/bodies worked out well. I use the 100-400 as a quick go to lens but the 200-400 was great. Usually had plenty of time to use the 200-400. Went with a company on a photography trip, more $$, but I had a seat all to myself with plenty of room for my stuff. This is what I would take again.
. The chance of a big white lens failing to the point of being unusable (it'll still work without AF or IS) is too remote to be worried about. There's much to be said for that. I used a non-IS 300/2.8 in all kinds of conditions until it finally wore out from old age. The same is true for 1D-series bodies. For me, there's too much risk when traveling in settling for anything less. I'm not a CPS member, but I agree that sending my lens and body in would help the problem. I can achieve tack sharp photos with it at any distance except very close, and at mid-distances it is OK but the keeper and hit rate is considerably lower than with my old 300mm f2.8 II. I think Alan F must be right regarding the bad copy, which in itself is enough reason for me to doubt the 100-400 ii. Have you checked the focus limiter switch on the lens? I normally set mine to focus on things that are a little farther out and occasionally forget to change the setting to allow focus on a close object. haha I wish it was a simple fix like that and I have fallen victim to that on occasion (as well as leaving the lens cap on!) but nope, it focuses and takes a picture at close range but the focus is almost always a miss. Almost always missing behind despite full correction on the AFMA. Worth a shot because I have done it myself. I wouldn’t give up on the lens until I had sent both body and lens in for evaluation. If you have enough gear for Gold CPS, you might find it cost effective to join for a year. A friend of mine was sending in his gear for a clean & check, it was cheaper to join CPS & get their free CMS checks under the program. This is assuming you are in the US. I find the 100- 400 II a very usable lens when I can’t go with one of the big white lenses. I have been tempted by the Tamron & Sigma mega zooms but hear too much I don’t like about the long end. I borrowed the 400 DO II for an air show and was surprised at the high quality images with a 1.4x TC III. I really like CRG’s 400 2.8 II approach if you don’t want to go zoom. I would probably go that route if not for the 8.5+lb - the reason for my interest in the DO. Only problem is f8 with an extender. The original 600mm was about the same weight as the 400 2.8 II and it was a handful to deal with for a full day of shooting when I was only 50. Too bad we can’t get all of this great glass in a package that weighs 3-4lbs! With more generous resources and luggage restrictions I would be happy to bring a couple of full frame bodies with an appropriate range of awesome glass. My current situation involves tetrising the best of my current equipment along with ALL of the rest of my luggage into a standard carry-on allowance for maximum mobility. My most recent mix includes the 200mm f2.8 L II, 17-55 f2.8, and 10-18 each in their own Think Tank lens pouch inside a 5.11 Tactical All Hazards Prime 29L backpack along with my MacBook Pro and all of the necessary cords and converters. My 7DMkII with the new EF-S 18-135mm are in separate LowePro toploader. The range of the 18-135 makes it easy to be ready for anything that might pop up during mid-day light, and the others go on as needed.